Home Unlabelled Shots fired: Is Street Art Still Street Art? 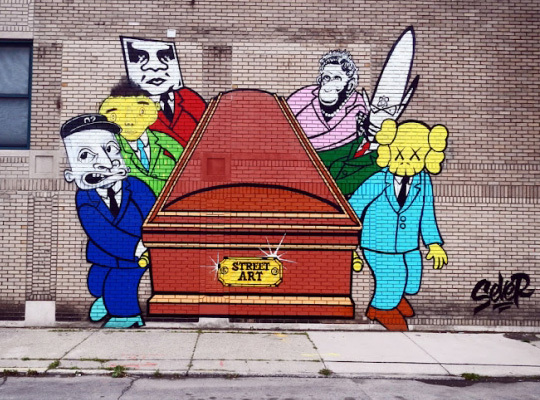 Shots fired: Is Street Art Still Street Art? Origins are important. History is important. Knowing ones origin and linage has always been a prime dictation of your identity. Your self awareness always seems to come from your family background and origin, your parents came from here and there, hence you celebrate this and that. A very large part of yourself of course, but such things do not only pertain to self awareness and identity but as well as culture and the arts. An origin story is very vital for an art movement and not just comic book heroes, may it be from abstract, conceptual art, to street art. But even with it's vitality, the origins of a movement is often trashed and forgotten once it is set in the limelight. In recent years street art has boomed in a way quite larger than life, from being shrugged off as mere acts of vandalism then gaining respect as an art form. Street art has definitely come a long way. Initially a movement that originated from system protest and punk ideologies, street art has now evolved into acts of commercialism and gentrification. It has become a movement commissioned on shirts, advertisements, and mass production, even though it had roots in a movement that supported both protest, Freedom and critical thinking. Street art questioned artistic formalities. It questioned the system. it's essence, fighting for nothing but money and sales in a gallery that knows nothing about the struggle for progress, the sweat of protest. With popularity comes the dilution of what it's supposed to stand for. The movement has come to a point where being a street artist has become a wonderful selling proposition to a prospect buyer. Galleries have been marketing street artists as a new breed of great masters of art without knowing where street art and graffiti came from, without understanding the movement and how it goes about. Galleries claim artworks to be street art in closed glass space where it is no where near the streets, how is street art such when it isn't in outdoor spaces, when it is safe, when it does not say anything other than wonderfully arranged, pretty and purchasable aesthetics. Street art has changed the landscape of the art industry, freeing the concept of art being elitist and exclusive in the walls of a gallery, to sharing it in open spaces to the public. But the very institution and industry that pushed them and denied them of their legitimacy in the art scene are the ones now claiming their brilliance and greatness. How will institutions feel when they find out the very existence of the movement they support was caused by the opposition of what they represented? How will the artists feel? How will the people?